If you think you don’t know Chris Stapleton, think again. This man has been Nashville’s best kept secret for over 10 years, writing hits for the likes of Luke Bryan, Darius Rucker, Kenny Chesney and even British songstress Adele to name just a few. Having established himself as one of the best songwriters on the country music scene with six number ones already under his belt, it seemed only fitting that the next step would be the release of his much anticipated first solo album – and boy was it worth the wait. Peaking at number 2 on the Billboard Top Country Album Chart and number 14 on the US Billboard Top 100 Chart, Traveller has earned Stapleton huge praise and has more than met the expectations for those awaiting his debut record. Two of the fourteen tracks on the album are covers. A cover can tell you a lot about an artist – many songs are changed so drastically when covered that you aren’t even sure what the original was. Stapleton however ensures that whilst making the song his own, he still tips his hat to the original and keeps what made these songs so popular to begin with at the root of his singing. The first, Tennessee Whiskey, is a song made famous by the late George Jones, who I think would have been more than pleased with what Stapleton achieved with his version of the hit. Stapleton gives the song a bluesy feel that even those who dislike country music crossing over into other genres would love. It showcases the rawness and versatility in his voice perfectly and along with the hard hitting Charlie Daniel’s Band cover of ‘Was It 26’ allows you to become engrossed in every word – a theme which runs throughout the album. 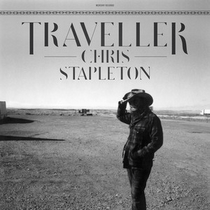 The album opens with lead single ‘Traveller’, an honest take by Stapleton on the new direction his life is headed. Written shortly after the death of his Father in 2013, this song coalesced during a 1,600 mile trip in a newly purchased Jeep with Stapleton’s singer/songwriter wife Morgane. It not only refers to the abundance of travelling which accompanies the life of a musician, but also has a deeper meaning in the new journey Chris was about to embark on without his Father. Lyrics such as ‘Couldn’t tell you honey, I don’t know, Where I’m going but I’ve got to go, ‘Cause every turn reveals some other road, and I’m a traveller’ show the lyrical emphasis that Stapleton puts on his songs, add in a catchy beat and vocals that give you goose bumps and you can see why this song is a clear favourite from the album. Stapleton’s vocals require no in-studio technological alterations and they are both raw and heartfelt. It is these attributes that really put this album on a pedestal for one of the best of 2015. Intimacy is at its hallmark – whilst listening I found myself drowning out all background noise and hanging onto every word as he delivered knock-out punch after knock-out punch where the first song is just as good as the last – there are no album fillers here. Songs such as ‘Daddy Doesn’t Pray Anymore’ and ‘Whiskey and You’ (side note: Tim McGraw saw the brilliance of this song and recorded it for his 2007 album Let Me Go) will never fit the criteria to be heard on the radio, but they do fit the criteria of a great country music song. All you hear are Stapleton and his acoustic guitar (and when songs are as good as these two that is all you need!). The soul in his voice will make the hairs stand up on your neck. When he needs to, Stapleton can shout out lyrics during the chorus of a song and then revert to a mere whisper during the verse allowing the listener to feel the sadness dripping from every line. This is a man who yields his voice like a deadly weapon, drawing in the innocent passer-by and allowing them to fall under the Stapleton spell. Other stand out songs on the album include ‘Parachute’, ‘Nobody to Blame’ and ‘The Devil Named Music’, which I would love to talk for hours about but I have run out of superlatives. In case you haven’t already guessed, this album is completely flawless. If I had to rate it out of ten I’d give it eleven, and would urge anybody who hasn’t already got a copy of Traveller to go out and buy two – one for the house and one for the car! It is rare to come across a record (in particular a debut record) to tick every box on the musical checklist. When Stapleton wants to give gut wrenching vocals that leave you senseless he can, and when he wants to give you that southern rock driving anthem to shift gears to and go that little bit faster he can. For those worrying that country music is dead, let me assure you that it isn’t. For those calling this Traditional Country – it isn’t, it’s just plain and simply country music in every sense of the word. From his beard to his boots this guy oozes country, and I for one feel privileged to have heard such a great record. Props have to go to Stapleton’s co-producer Dave Cobb (who has previously worked with the likes of Sturgill Simpson and Jason Isbell) in channelling the emotion and honestly in the music and allowing it to transcend beautifully into a piece of art. This debut album has earned Stapleton an unprecedented 3 Country Music Award Nominations, including Album of the Year and Male Vocalist of the Year. I for one hope that he produces a clean sweep, so that others may take note and follow Stapleton’s lead in returning country music to where it is at its best. In case you didn’t already know, Chris Stapleton will be at next year’s Country2Country festivals across the UK in March. If you get the chance to hear him sing, take it – you won’t regret it.